Years ago, I read "The Beak of the Finch", a Pulitzer Prize winning book by Jonathan Weiner about the research of Peter and Rosemary Grant on the island of Daphne Major in the Galapagos. They have spent over twenty years studying the various species of finches that inhabit the island. Their research of the finches has shown that natural selection is working faster than Darwin ever conceived it could when he developed his theory of evolution, and so fast that it can be witnessed in process. It was my first true introduction to Darwin's theories, and it has led to a real love of biology and respect for the natural world. The 13 species of finches are all fairly drab in color but their beak size and shape varies from species to species and is directly linked to their food sources. The finches are one of the many things Darwin observed on his voyage to the Galapagos on the HMS Beagle, and would later influence his development of a basic theory of evolution, as he had reasoned that all of the 13 must have descended from a common ancestor. Currently there is a really great exhibit at the Chicago Field Museum on Darwin. It's one of the better exhibits that they have had in awhile. There are plenty of misconceptions about Darwin and his theories, and so it is important that there is an opportunity for people to be introduced to the very human individual behind it all, as well as evolution. Also check out the blog for The Beagle Project.This is an ongoing project with the ultimate goal of building a replica of the HMS Beagle and sailing the world in 2009 in the tracks of Darwin and Captain Fitzroy's infamous 1831 journey, marking the 200th anniversary of Darwin's birthday. This is a watercolor on illustration board that will be going into a show at the Richard Goodall Gallery in Manchester, UK next weekend. Superb. Must give this some airtime on the Beagle Project Blog, and even venture across the Pennines to have a look at teh real thing. Dear Diana, I am beside myself. His jacket with the ferns and trees! The finches, each with a different beak! The one flying in with the nest material (or is that a bit of Darwin's beard?)! Unfortunately I can't make it up to Manchester. Is there any chance you might make prints available? At the very least your picture is now gracing my computer desktop. Wonderful. 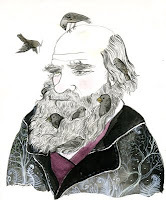 You should make these into Darwin Day cards. There's a lot of hidden demand out there. He must have known all the aspects of finches since he was studying them for 20 years, I hope I could have met him.